One of my biggest strengths as an athlete is my ability to recover. In the past two years, some extreme examples of this include a PR trail marathon (1:51, 2500+ feet of climbing) the morning after a 90 mile bike ride, minimal soreness following Ironman Lake Placid, and going for a run with Taylor the morning after a PR at Ironman Lake Stevens 70.3. All this aside, I did not think that I stood a chance to race Quad Dipsea on 11/30 following my ankle injury over the weekend. I couldn’t walk further than the kitchen on Sunday, and my focus shifted to making x-ray appointments as soon as possible. 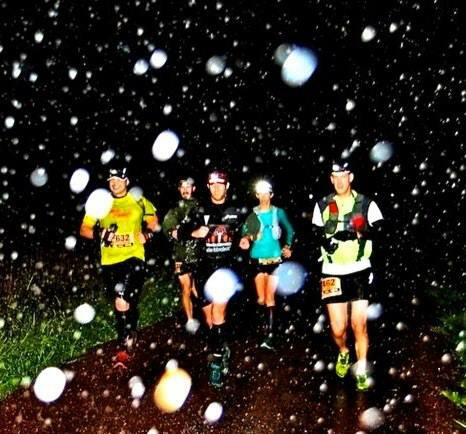 A look back at rainy days past: grinding it out at TNFEC 50 miler around 5:30 AM in a downpour. I received a major boost late Monday when my doctor confirmed that my foot and ankle x-rays both came back negative. Walking was still difficult, but my doctor gave me the green light to continue activity pain permitting (and within reason). Then it happened: I woke up Tuesday with barely a limp following two days of RICE (rest, ice, compression and elevation). Running is not quite in the cards yet. Running in a downpour (this is maybe the third rainy day in the past six months here in SF) will never be in the cards following 50 miles in the mud last December at North Face Endurance Challenge. Instead, my first real test will be taking Taylor for a test ride on her new bike this Saturday (honorable mention: walking up the stadium stairs after a couple beers when we watch Hunger Games: Catching Fire on Saturday night). If all goes well, I’m going to attempt a short, easy run on soft ground Sunday morning. I’m not in the clear yet, and I’m certainly not going to put my health in jeopardy for the sake of running an ultra in the mountains next weekend, but this has certainly been one of my most miraculous recoveries to date. Good luck! Hope it heals quickly!